Dentin is a Light Yellowish Viscoelastic material made up of Inorganic (Hydroxyapetitie) and Organic (collagenous fibrils and mucopolysaccharides) material which is harder than bone. Dentin thickness is 3-10 mm based on the location. Dentin is made up of dentinal tubules which are S shaped and perpendicular to Dentino enamel junction and Cementoneamel junction. Odontoblastic Processes: These are cytoplasmic extensions of Odontoblasts, which extend into the dentinal tubules as odontogenic processes. These are larger in diameter at the pulp when compared towards the dentin. These processes sometimes extend upto the Dentin-Enamel Junction. 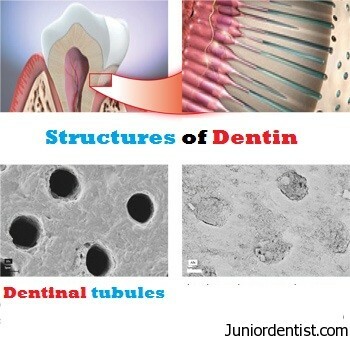 They are composed of Microtubules, Filaments, mitochondria, lysosomes, microvesicles etc..
Peritubular Dentin: The dentin that immediately surrounds the dentinal tubules. It is more mineralized than the intertubular dentin. Intertubular Dentin: It is the main body of dentin. It is located between the dentin tubules or between zones of peritubular dentin. Mantle Dentin: It is a type of Dentin which is present under the Dentin-Enamel Junction. Pre Dentin: It is the first formed dentin as seen in the name and it is not mineralized. Pre Dentin is located adjacent to the pulp tissues. Primary Dentin: Mantle Dentin is the first formed dentin which is mineralized. Circumpulpal dentin forms the remaining primary dentin or the bulk of the tooth. It represents dentin formed before root completion. Secondary Dentin: It represents the dentin formed after root completion. It contains fewer tubules than primary dentin. Secondary Dentin is also called as Adventitious Dentin. Teritiary Dentin: It is the reparative, response or reactive dentin which is formed in response to trauma such as Caries, and restorative procedures. It is charecterized by irregular and few tubules. Sometimes t contains cellular inclusions within the matrix, Tertiary dentin is also known as Osteodentin. Incremental Lines of Von Ebner: These are also called as Imbrication Lines. They appear as fine lines or striations in dentin. They are at right angles to dentinal tubules and represent rhythmic, recurrent daily deposition of dentin. Contour Lines of Owen: Some of the incremental lines of Von Ebner are accentuated due to disturbance in matrix and mineralization process. Interglobular Dentin: Mineralization of dentin beings in small globular masses that fail to coalese. so the areas of hypomineralization between these are known as interglobular dentin or spaces. Tomes Granular Layer: This is the granular layer adjacent to the cementum and visualized by observing ground sections in transmitted light. This increases towards the root apex and is due to coalescing and looping of terminal portions of dentinal tubules. Tomes Fibers: These are odontoblastic processes within the dentinal tubules. Korffs Fibers: These are fibers seen in the Mantle Dentin which is seen at the DEJ.